Home to the administrative offices of the Western OSHA Education Center, this building also houses the administrative, advising and faculty offices for ASU's School of Sustainable Engineering and the Built Environment and the Del E. Webb School of Construction. This facility boasts state of the art classrooms, a fee based public parking structure is across the street, restaurant and retail are in the building and light rail access within one block. Located on College Avenue, just north of University Drive in Tempe, Arizona. All day public parking is available in the Fulton Center Parking Structure directly across the street on College Avenue. Additional options for overflow parking are available in the surface parking lot directly south of the building on 7th Street between College and Forest. 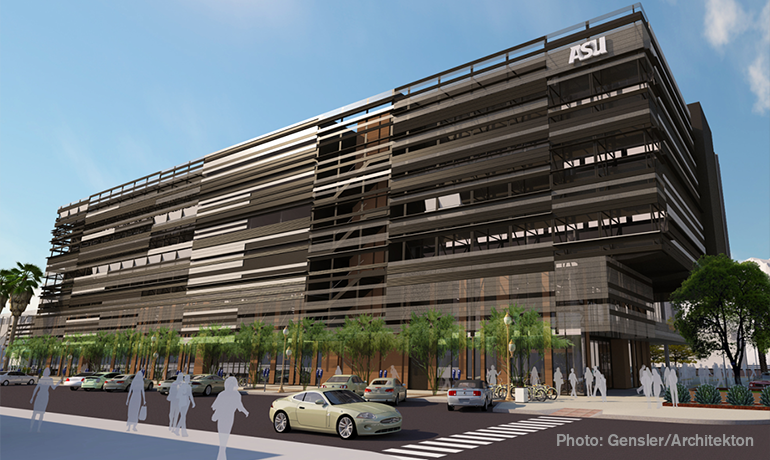 There is also a City of Tempe Parking Structure accessed from 5th Street and Forest Avenue. The building has metered parking spaces on the street that are available for visits less than 3 hours. The City of Tempe's Transportation Center is located one block away at College Avenue and Veterans Way, giving easy access for bus and light rail. Use the Veterans Way/College Light Rail Station. The facility is located minutes from Sky Harbor Airport. Take the Sky Train to the Metro Light Rail and proceed east to the Veterans Way/College Station, or exit the Airport on 143 South, take the University Drive exit and proceed east approximately 4.5 miles, turn left on College Avenue. All classrooms and public areas feature free wi-fi access (select ASU-Guest) for our visitors and class attendees. The Sun Devil Campus Store is located on the first floor of the building and carries ASU branded apparel and gifts along with miscellaneous supplies. There is a technology center located on the second floor that carries computer supplies. The first and second floors feature dining options including a "grab and go" shop and the "Pitchforks and Corks" sandwich shop and wine bar. There are numerous dining options in any direction from the building on College Avenue, ranging from fast food to casual dine in restaurants, as well as several coffee shops. Mill Avenue, only two blocks to the west, features dozens of options for dining, shopping and entertainment. Hotels near the building include Tempe Mission Palms (3 blocks) and the Marriott Downtown Tempe Residence Inn about a block and a half away. We maintain a discounted group rate at many of the hotels that surround the ASU campus. Rates for the Residence Inn (closest to our building) can be found on-line at www.marriott.com by selecting the "special rates & awards" tab and entering the code AZ1, or call the hotel directly at 480-967-2300.